Golden Key With Coins Secured Investment Finance PowerPoint Templates And PowerPoint Themes 1012-Visually support your Microsoft office PPT Presentation with our above Template illustrating Golden Key along with golden coins on a beautiful dollar background. This Template Signifies the concept of asset, speculation, venture, outlay, savings, deal, stock, share, venture capital, security, investing, capital spending, financing etc. Use our creative template to lay down your views.-Golden Key With Coins Secured Investment Finance PowerPoint Templates And PowerPoint Themes 1012-This PowerPoint template can be used for presentations relating to-"Golden Key With Coins, Security, Symbol, Money, Finance, Business" Generate the right work ethic with our Golden Key With Coins Secured Investment Finance PowerPoint Templates And PowerPoint Themes 1012. Promote the need for correct practices. Experience fantasy with our Golden Key With Coins Secured Investment Finance PowerPoint Templates And PowerPoint Themes 1012. Energise the creativity of your audience. We present our Golden Key Between Dollar Coins Security PowerPoint Templates PPT Backgrounds For Slides 0113.Use our Security PowerPoint Templates because These PowerPoint Templates and Slides will give the updraft to your ideas. See them soar to great heights with ease. Present our Signs PowerPoint Templates because Our PowerPoint Templates and Slides will give good value for money. They also have respect for the value of your time. Use our Money PowerPoint Templates because They will Put the wind in your sails. Skim smoothly over the choppy waters of the market. Download our Marketing PowerPoint Templates because Our PowerPoint Templates and Slides will let your team Walk through your plans. See their energy levels rise as you show them the way. Use our Shapes PowerPoint Templates because Our PowerPoint Templates and Slides will embellish your thoughts. 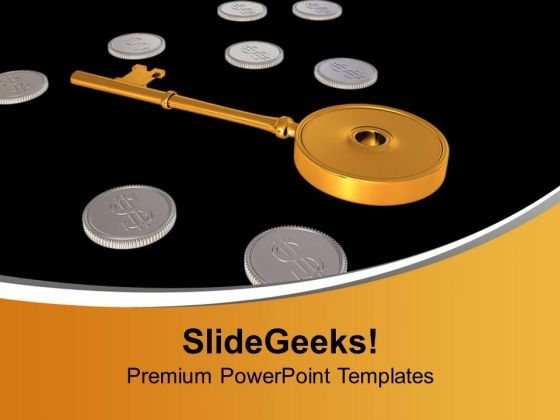 See them provide the desired motivation to your team.Use these PowerPoint slides for presentations relating to "Golden key with coins, security, signs, money, marketing, shapes". The prominent colors used in the PowerPoint template are Yellow, Gray, Black. Use our Golden Key Between Dollar Coins Security PowerPoint Templates PPT Backgrounds For Slides 0113 are effectively colour coded to prioritise your plans They automatically highlight the sequence of events you desire. The feedback we get is that our money PowerPoint templates and PPT Slides will make the presenter look like a pro even if they are not computer savvy. Customers tell us our Golden Key Between Dollar Coins Security PowerPoint Templates PPT Backgrounds For Slides 0113 will impress their bosses and teams. Customers tell us our money PowerPoint templates and PPT Slides will generate and maintain the level of interest you desire. They will create the impression you want to imprint on your audience. Presenters tell us our Golden Key Between Dollar Coins Security PowerPoint Templates PPT Backgrounds For Slides 0113 are designed to make your presentations professional. 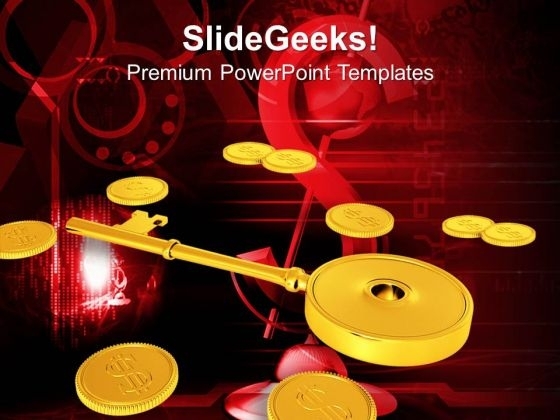 Presenters tell us our money PowerPoint templates and PPT Slides will impress their bosses and teams. Project your exercise regimen on our Golden Key Between Dollar Coins Security PowerPoint Templates Ppt Backgrounds For Slides 0113. Elaborate on the benefits of each set. Attain success with our Golden Key Between Dollar Coins Security PowerPoint Templates Ppt Backgrounds For Slides 0113. You will come out on top.